Creativity and collaboration meet in this showcase of AKRILICA Series poets. 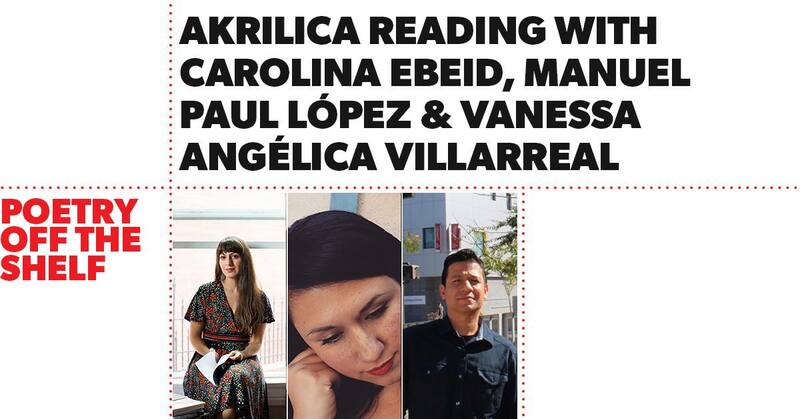 AKRILICA, a co-publishing venture between Noemi Press and Letras Latinas, showcases innovative Latinx writing. Carolina Ebeid is a poetry editor at the Rumpus and the author of You Ask Me to Talk About the Interior. Her poems have appeared widely in journals such as AGNI, Gulf Coast, jubilat, the Kenyon Review, and Poetry. Manuel Paul López’s books include These Days of Candy, The Yearning Feed, 1984, and Death of a Mexican and Other Poems; he also coedited Reclaiming Our Stories. Vanessa Angélica Villarreal is the author of Beast Meridian, winner of a John A. Robertson Award for Best First Book of Poetry from the Texas Institute of Letters and featured as a best-of book at the Los Angeles Times, NBC News, BOMB, Literary Hub, Bustle, and Entropy.